Vlad Mezrich is a pseudonym, of course. The Vampire Is Just Not That Into You was written by several authors and was compiled and edited by Scholastic Press. 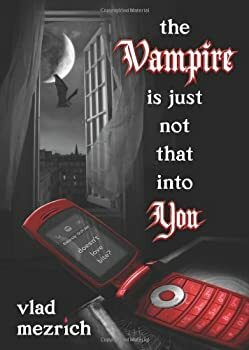 The Vampire Is Just Not That Into You by "Vlad Mezrich"
"Vlad Mezrich" is a pseudonym for a team of Scholastic writers who pooled their satirical talents to create this fun little book (David Levithan is the editor). The Vampire Is Just Not That Into You parodies dating guides, teen-magazine quizzes, and most of all, current tropes in vampire literature. Twilight gets the lion's share of Vlad's snark, but there are references to Anne Rice, Bram Stoker, and others as well.